No pictures with this – just a pet peeve! Where have all the sheets gone?? For years, I thought only Germany and Austria used just a duvet on beds without a top sheet. I’ve been known to pack my own flat sheet to get around this problem. This trip we’ve been in more hotels than not who use just the duvet and forego the top sheets. These are way too hot for us to sleep but so far I haven’t resorted to one trick – take the duvet out of the cover and sleep with just the cover. Pillows … way too hard! I was thrilled at the Intercontinental at the Johannesburg International Airport after 3 weeks in Africa to find soft, squishy bed pillows at 3 AM! The Sheraton and Meridien hotels in Koh Samui have great pillows, too. I’m enjoying the Aloft pillow in Bangkok, too, for a few days. Screen in screen technology at the Bangkok airport. In the upper right corner, you can see luggage moving along. We flew Bangkok Airlines to and from Koh Samui and we checked bags both ways – don’t ask! At the Bangkok end, we waited quite a while (about 20 minutes) for our luggage to show up (and this was after a potty stop). The airport entertains passengers with ads on a big screen above the carousel. At some point, we noticed a little screen was added to the big screen. 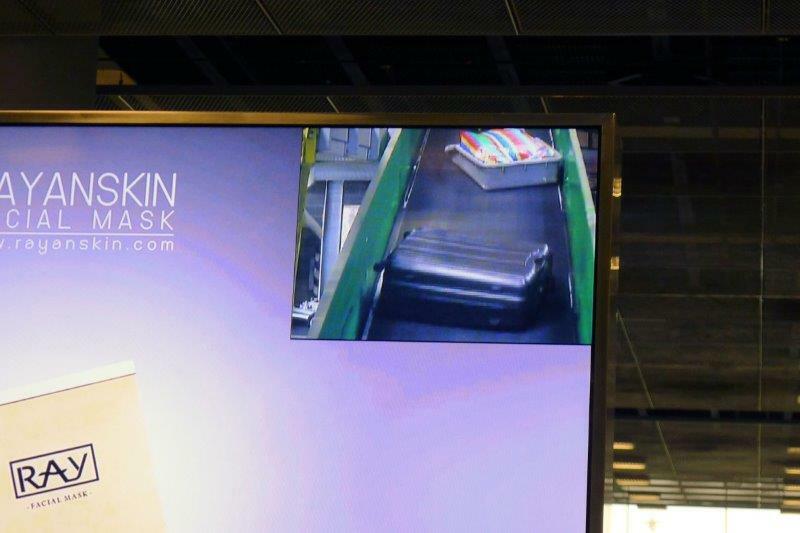 Then we figured out we were seeing suitcases moving through the luggage system at the airport. THEN, we saw our 2 suitcases fly by on the screen. This gave us some hope that the luggage was on the way or at least was in the bowels of the airport someplace. This is pretty cool technology. Think DIA (DEN) would ever install a few cameras in strategic locations in the luggage areas? At least it relieves the boredom of just standing and waiting. We don’t know what this is but the chips were really good! 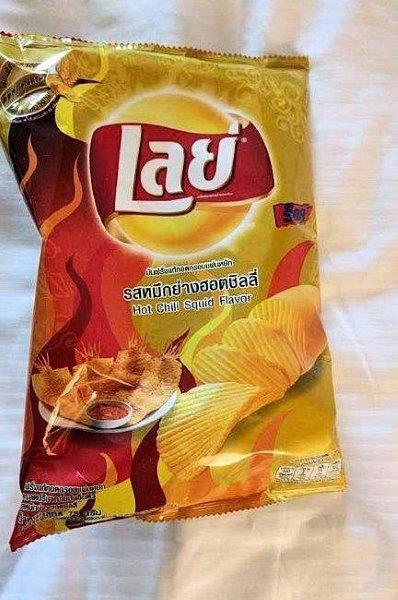 Susan loves to hunt for different flavors of potato chips when she visits different countries. (This all started in Bhutan.) 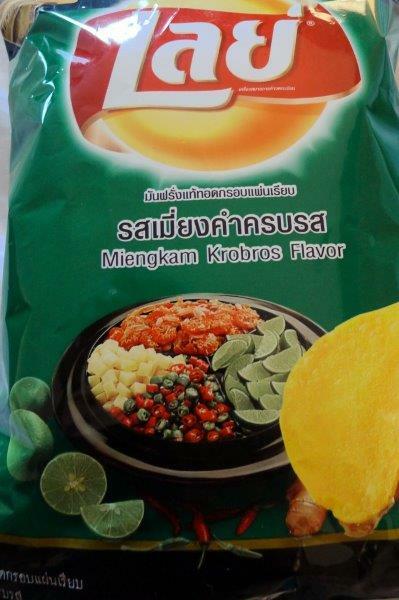 These are ones we found in various grocery stores in Thailand. Then there are the signs on public transport. 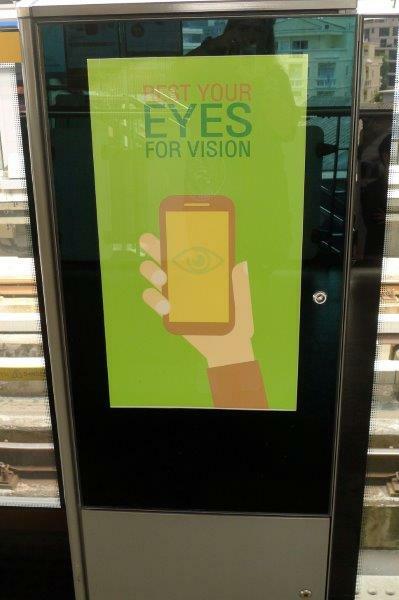 Obviously, spending too much time looking at cell phones is a problem all over the world. These signs are posted on the SkyTrain metro system in Bangkok. And, yes, cell phones are everywhere! 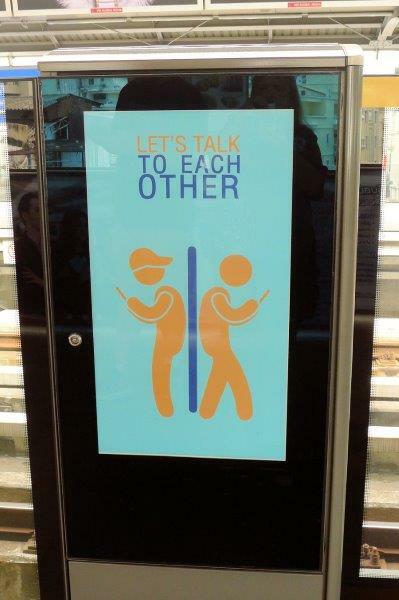 The Scotland trains aren’t the only ones who think we should talk to each other! 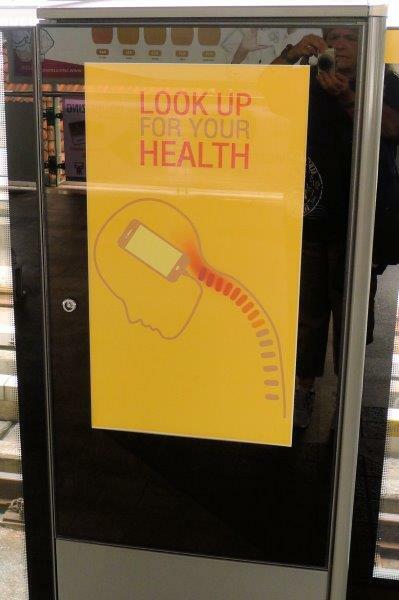 And look up! Mark reached the point he doesn’t move for someone walking and looking down. He just lets them run into him. We’ve been traveling for almost 5 months and haven’t had Mexican food the whole time. Mark found this place, Sunrise Tacos, that gets good reviews and it’s right near our hotel. Why not? The food turned out to be pretty good Mexican. They even had spicy sauce for Mark’s burrito. 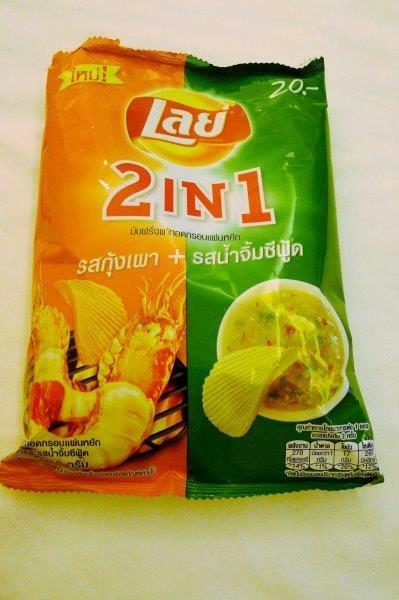 You say … but Thais know how to do spicy! That’s true but we’ve discovered they are somewhat reluctant to serve it to westerners. We don’t know if they think that all Europeans and Brits and US people don’t like spicy, but Mark has to convince most people that he actually likes HOT food! Even Susan can eat medium spicy in restaurants for tourists. This was our first Mexican food in 5 months. We ate at Sunrise Mexican in Terminal 21 in Bangkok. 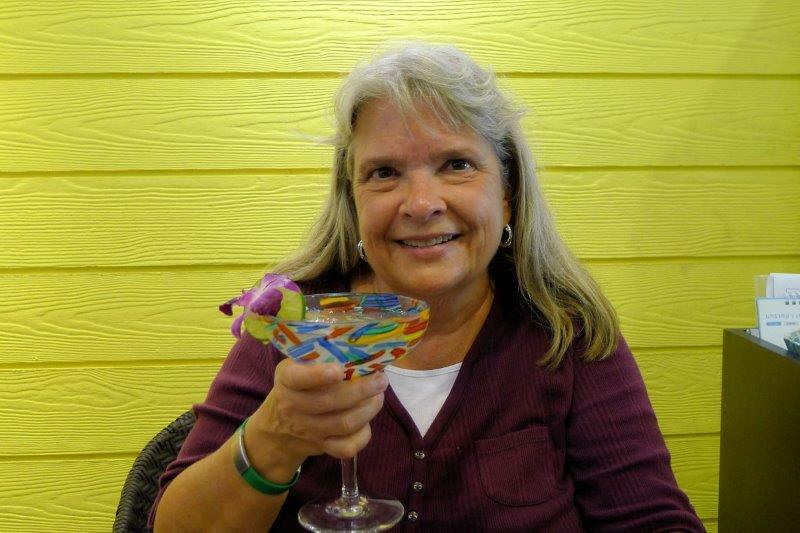 The margs were pretty good and the glasses even better! 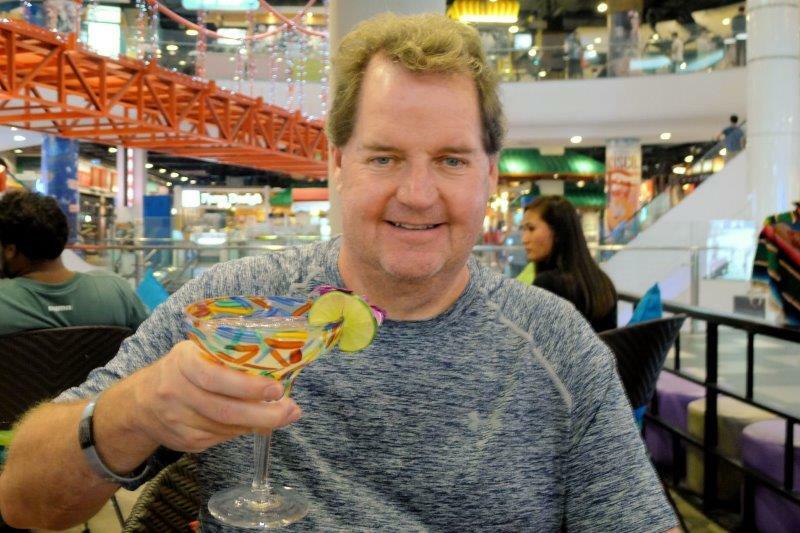 Mark enjoyed the margarita, too. We sat by a couple we think were from Russia and they liked the food, too. 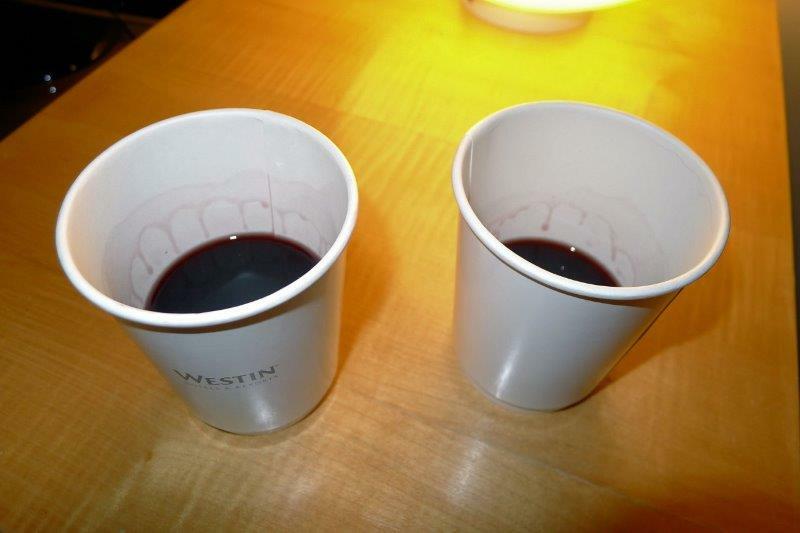 We couldn’t take the lovely wine glasses out of the Executive Club Room so they gave us to-go cups for our wine to take to our room. Too funny! To go cups for wine to our room in Bangkok. The wine was almost done, anyway.